A project to expand State Highway 9, which runs north through Grand and Summit counties, received a $4 million matching grant from the owner of Blue Valley Ranch. The announcement came during Tuesday’s meeting of the Grand County Board of Commissioners, who all voiced their support for the project. The Blue Valley Ranch, located outside of Kremmling, is owned by billionaire hedge fund manager Paul T. Jones II of Greenwich, Conn. Jones previously donated $945,000 to kickstart the improvement project. The project will be submitted to the Colorado Department of Transportation’s Responsible Acceleration of Maintenance and Partnerships (RAMP) program, which seeks to expedite important road improvement projects in the state. To qualify under RAMP, local governments must raise 20 percent of the total cost of a venture and submit an application that explains why a project should be put on a fasttrack for completion. Total cost of the Hwy. 9 project is estimated by CDOT to be $46 million, which means the local match for the improvements would be approximately $9 million. With Blue Valley Ranch’s existing $945,000 donation and the $4 million matching grant, $4.3 million is needed to meet that goal. Citizens for a Safe Hwy. 9 Committee, headed by lifetime Grand County resident Mike Ritschard and formed by area residents, will assist Grand County commissioners in raising the necessary funding to make up the local government’s share of the costs. From 1993 to 2012, CDOT reported 590 accidents on the stretch of Hwy. 9 that would be rebuilt if the project went through. Of those, 191 people were injured; 16 died. Wy. 9 has also been identified among the top 100 miles in Colorado impacted by wildlife migration. The highway also does not meet state construction standards. Since 2006, there have been 455 documented wildlife mortalities from the Summit County line to the Colorado River. A pre-application for the RAMP program is due to CDOT by May 1, at which time CDOT officials will review each application and will sign the proposals that meet the minimum criteria for the program. On July 1, the full application for the project will be due to CDOT. 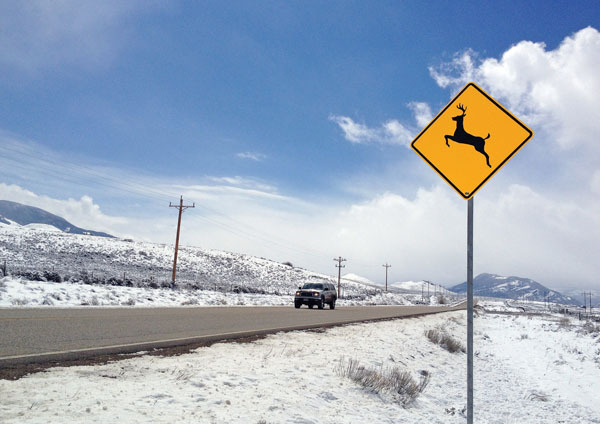 The project would include enhancements to help prevent accidents spawning from wildlife crossings on the highway from mile marker 126 to mile marker 137 if approved by CDOT. The stretch of highway included in this project is located between Green Mountain Reservoir and the Colorado River crossing. The project would include five wildlife underpasses and two overpasses, the first of their kind in Colorado, as well as 8-foot fencing along the right of ways to push wildlife toward the crossings. The project would also entail widening of the highway to meet state standards and vertical and horizontal alignments to meet the 65 mph design speed. Eight-foot shoulders would also be constructed along the highway, which would be large enough to accommodate a bike lane, and side slopes of the highway would be flattened to allow for a vehicle recovery area. Hwy. 9 in this part of the Lower Blue River Valley runs through a winter migration path for wildlife, separating prime winter range on the east side of the highway from the only winter water source in the Blue River on the west side of the highway. This daily migration puts wildlife in the path of cars and trucks on the stretch of road, according to a press release from the Citizens for a Safe Hwy. 9 Committee. The road is frequently used by school buses and by visitors traveling to recreation destinations in Summit, Grand, Routt and other counties in northwest Colorado. The highway can regularly become congested with traffic, according to the press release, which creates an even higher risk of collision between wildlife and vehicles, particularly at night.